As you can see on the Home Run Tracker to the right, 25 players have hit 500+ home runs – impressive. And only 27 MLB players have reached the 3,000 hit mile marker – also great Cooperstown credentials. But for the four players who combined a thunderous stick with a lighting swing that enabled them to tally both 500+ homers and 3,000+ hits, the sky was the limit. 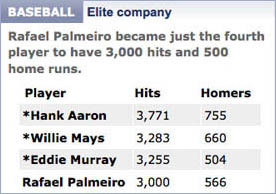 These four all-time All Stars are no strangers to www.500hrc.com fans: Hank Aaron, Willie Mays, Eddie Murray and Rafael Palmeiro. Their legendary longevity and consistently definitely warrant another look. 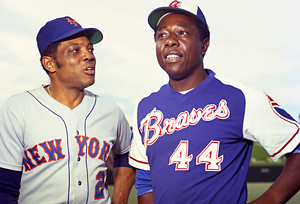 Henry Aaron was the first major leaguer with 500+ home runs to get his 3,000th base hit on May 17, 1970. At the time he had tallied 589 round-trippers and he was just heating up. Before Hammerin’ Hank was done, he ran his total up to 755 long balls and 3,771 of the shorter variety. The bar was definitely set high and, so far, no one has leapt over. Just two months and one day after Aaron created the category, “Say Hey” Willie Mays followed suit, getting his 3,000th base hit on July 18, 1970. At the time he had 620 home runs, and his slugging numbers remained high with 40 round trippers in the final 283 hits of his great career. He finished with the stellar, albeit secondary stats of 660 homers/3,283 hits. Since then, Oriole legend Eddie Murray and journeyman slugger Rafael Palmeiro have been the only other players to possess the rare combination of power and longevity needed to complete this two-part marathon. The only switch hitter to completed the homer/hit perfecta, “Steady Eddie” Murray collected his 3,000th hit on June 30, 1995 in an Indian’s uniform after being traded to Cleveland in 1994. 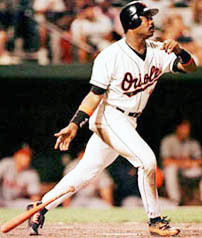 Then, after returning to his beloved Baltimore, Murray finally became the 15th member o the 500 Home Run club on September 6, 1996. A fitting ending for the iconic ironman of baseball who hit 504 homers despite never hitting more than 33 in a single one of his 17 seasons in ‘da show. Rafael Palmeiro became the most recent member of this ultra-exclusive group (but the second who played extended time in Baltimore) on July 15, 2005, when the left-handed slugger slapped a double down the line against Mariner’s pitcher Joel Piûeiro, tying Roberto Clemente for 25th on the all-time hits list. He passed Clemente with a single to center in the top of the sixth. Having already collected his 500th career dinger two years earlier (on May 11, 2003) off Indians pitcher Dave Elder, Raffy continued to crank out hits of all sizes before ending his colorful career with 569 homers and 3020 total hits.